Here is a card I was really not expecting to see in an upcoming core set. Although, it has been a powerhouse in Modern for quite a long time, a fact that has as much to do with someone forgetting to make Valakut legendary as with Scapeshift itself. It also has a role to play in other large-card-pool formats, as its effect calls back to the incredibly powerful Crop Rotation from Urza’s Legacy. Its mana cost means it’s a little less crazy outside of the Valakut combo, and it’s hard to use for straight-up acceleration unless you go for something like the Tron lands, but it’s a decent piece of action if you’re using Lorwyn‘s hideaway lands or the like. This is actually first time Scapeshift has been reprinted since its original printing in Morningtide, which was ten years ago. And this is a very welcome and surprising reprint, as Scapeshift is a card that was pushing $60 on the secondary market. So more supply is always good! Scapeshift is, frankly, more of a Modern-focused reprint than one meant for Standard. The effect is basically swapping some of your lands for more out of your deck. This can be a nice way to thin your deck, correct for colors, and make it easier to draw into gas. Countering the spell isn’t a huge loss, as you sacrifice lands on resolution of the spell, and so you’re not risking it all to tap out for a Scapeshift. 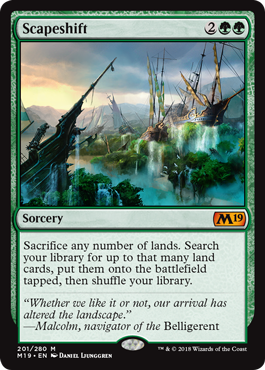 In Standard, though, it’s “okay” at best, as most of the powerful lands are the Ixalan flip lands, which this can’t fetch (since they’re enchantments or artifacts in the library). In Modern, though…Scapeshift is nuts. And that’s largely due to Valakut, the Molten Pinnacle. You use a series of land-search effects to load up your field with at least seven lands, usually Forests. Search for Tomorrow, Cultivate, Rampant Growth, Sakura-Tribe Elder…you get the point. And Primeval Titan, too. He’s part of the deck. Pop Scapeshift. If it resolves, sacrifice seven lands and get Valakut, the Molten Pinnacle and six Mountains. Scapeshift is a powerful combo piece. It’s poor in Limited, but who cares? It’s a welcome reprint and an excellent way to herald the triumphant return of core sets.